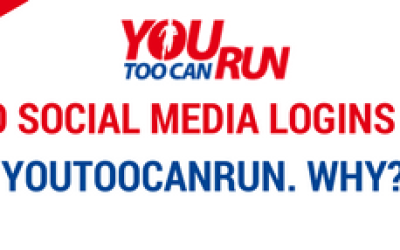 The mission of YouTooCanRun is to inspire non runners to take up running for good health. It seeks to do this by presenting inspiring stories of runners who are achieving great heights in running inspite of several challenges. The Challenging Ones is an organisation spearheaded by Kargil War veteran Major D P Singh who is India’s first Blade Runner. 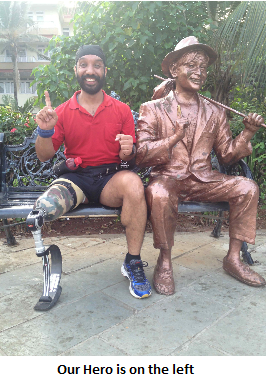 The objective of The Challenging Ones is to encourage amputees to take up running. Major D P Singh himself is hoping to train better and be possibly India’s first entry into the ParaOlympics. Thus the fit, in terms of objectives between YouTooCanRun and The Challenging Ones is very close and aligned. 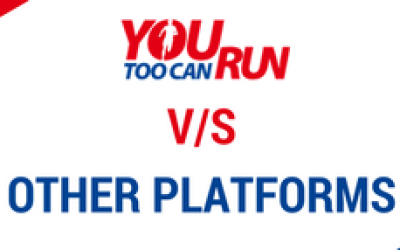 Both seek to provide inspiration to non runners to take up running for good health. YouTooCanRun had the privilege of hosting Major D P Singh over the last weekend of Saturday 9th and Sunday 10th in Mumbai. Saturday early morning saw Venkat and DP at the Taj Land’s End fully geared up for a 10K run. 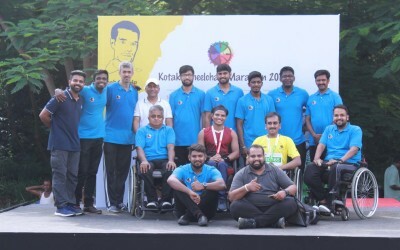 They were joined by the Cardiac Atheletes from Asian Heart Institute who were being trained by Venkat to do their first Half Marathon at the SCMM of Jan 2014. But that is another inspiring bunch. Most of them are 50+ in age and have undergone Open Heart Surgery. And are still good runners aiming for their first 21 kms distance. 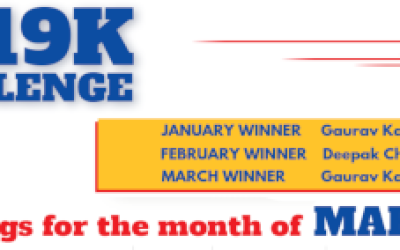 The Cardiac Atheletes were targeting their first 16K distance. run along with us. Many waved their hands in a sign of acknowledgement and encouragement. AutoRiskshaw drivers, normally known for their scant respect for pedestrians, slowed down or stopped to allow us to pass through. At one point we were crossing the road at Mehboob Studio when a BEST bus chanced upon us. The driver slowed down and allowed us to cross the road without incessantly blowing his horn. Civility reigned. Everyone loves an underdog. After we finished our run, we had a cool down walk along the Bandra Promenade. At one point, DP sat and took pics with the statues of yesteryear film heroes. Here is the one of his with Raj Kapoor. Of course our hero is the one on the left. Major D P Singh continued. 10.30am saw Major D P Singh mingle with several heart patients of Asian Heart as well as the runners of Bombay who had been invited to an inspiring talk. He took the stage and went through his entire narrative of his life. Of how he faced a gun motor attack at Kargil, how he was bought in the hospital and declared almost dead, how he was found to be still alive and how he recovered and today be the amazing runner that he is. His talk was received with rapt attention by the audience and the question and answer section that followed was quiet engaging. Many of the questions asked were from the perspective of a normal runner. 1. Normally runners are advised to run facing the traffic. But in the case of Major DP Singh, he can run comfortably only on left side of the road that is along the traffic. This is because there is always a slight camber on the road and with his right leg having the prosthetic, if it slopes downward then there is the tendency for the prosthetic leg to come lose. The slight camber being on the right side when he is running on the left side helps in keeping the prosthetic leg firmly in place. 3. Only one shoe of the pair is used and the other as to be wasted and thrown away unused. 4. Preparation time in the morning is much much more then what it is for the normal runner. 5. Strengthening exercises as well as stretches have to be different and cannot be the same as usually for runners with normal legs. The runners sincerely appreciated his charisma and his perseverance in running inspite of being differentially challenged.